At 63 going on 64, I care about Social security. Of course, we should all care about Social Security. One of our perennial political problems has been that so many of the present beneficiaries of Social Security seem to care about it more than they seem to care about any other issue facing our country, and that their political clout has prevented the rest of society (including, therefore, those actually paying to sypport today's retirees) from caring enough to take on the challenge of making Social Security sustainable for the long term. For better or for worse, we are all being told nowadays - and not just by the governor of Texas - that Social Security is a "Ponzi Scheme." Certainly Social security has some superficial resemblance to a "ponzi Scheme." That's not unlike the fact that - as a man and an American citizen - I have something in common with Barack Obama. But that resemblance is not sufficent to make me also President of the United States - much less thin and fit! What Social Security is - has always been, in fact - is a transfer payment. In other words, it is a social welfare program. Today's workers pay to maintain today's retirees (yesterday's workers) - and hope that tomorrow's workers will in turn pay to support them, which they will do unless Americna law and present policy change. (Thus, Social Security is the main reason that seniors are among the least poor in our society, since they benefit from this massive transfer of wealth from the young to the old. This is true in less direct ways as well - ie., the short-changing of "discretionary" expenditures, such as education, while entitlements such as Social Security remain untouchable). Social Security's resemblance to a proper "Ponzi Scheme" is real but superficial, because unlike a "Ponzi Scheme" Social Security's reliability rests on the credit - and credibility - of the United States of America, a sovereign state (and one which, unlike Greece for example, controls its own currency). As long as the United States remains committed to behaving as sovereign states are supposed to behave and thus remains committed to fulfilling its obligations to its citizens, Social Secuirty stands. That it would not do so has, of course, hitherto been unthinkable - at least until a significant segment of the Republican Party decided to advocate defaulting rather than paying our bills, as happened (to most of the world's amazement) this past summer. The problem, then, is not some malevolent flaw at the heart of Social Security, but how to sustain it in the face of our society's demographic transformation - a larger senior cohort than ever before, living longer than ever before, and (this impacts Medicare) spending more of the country's money on health care than ever before. All Western society's have some variation on this problem. Those that are also committing demographic suicide by not having sufficently large families have the problem in an even more extreme form. So, by all means, let us look at appropriate adjustments to entitlements to reflect the demographic transformation of our society, but let's start by stopping all the silly sloganeering! A time-honored substitute for debating the substance of an issue is sloganeering name-calling. The slogan of choice being thrown around right now seems to be “class warfare.” What exactly “class warfare” is remains somewhat undefined. In the current demagogic use of the term, it seems to refer to anyone who believes (1) that the government needs additional revenues to deal with the deficit created over the last decade by the previous (Republican) administration, and (2) that one obvious source of such revenue would be repealing the tax cuts for the wealthiest group of Americans, the very same tax cuts that helped cause the current deficit in the first place. In addition, (3) those who advocate this course of action are more likely (than those who don’t advocate it) to believe that our increasing social and economic inequality and its accompanying hardships on an increasingly larger percentage of the population are socially and politically destructive. In 1996, David Plotke (Building a Democratic Political Order) called that latter idea the “common sense” of American politics from the mid-30s through the mid-60’s (I’d say actually even further into the 70s). Americans have always been squeamish about the concept of “class.” Unlike race and ethnicity, for example, which we have always been very conscious of, “class” has often had a foreign, essentially European sound to it. There is a good reason for this, of course, since, unlike Europe, the United States, for most of its history, has been much more culturally and politically egalitarian, both mirroring and supporting the reality of a relatively (again compared with the societies most Americans had immigrated from) high degree of social and economic mobility. Thus, we have the often remarked peculiarity that many Americans simultaneously denied the reality of class in America and were also likely to label themselves as “middle class.” When I was a political scientist, it was also argued that many of racial and ethnic divisions in our society were really (or at least also) class divisions, and that class conflict was, so to speak, hidden in our history of racial and ethnic conflict. One result of all this has been the difficulty historically of creating a political ideology or organizing political activity around the concept of class. Hence, the chronic failure of the “Left,” understood in a European sense. To be sure, for much of the 20th century the US had a vigorous liberal-democratic “Left,” a coalition of which organized Labor was a key component. But a truly European-style social-democratic "Left" has always been much more marginal, and overtly Marxist and radical movements even more so. The 1960s renaissance of European-style leftist thought and radical movements, moreover, was largely found among students and intellectual types – more often than not separate from and even hostile to the traditional social and economic concerns of organized labor and its liberal-democratic political allies. One obvious consequence of this has been the intellectual Left’s increased preoccupation with cultural and moral concerns (abortion, gender issues, etc.). Such concerns were, of course, quite alien to the traditional liberal-democratic concerns associated, for example, with the Labor Movement, and have tended over time to crowd out such traditional social and economic concerns. The result has been an enfeebled liberal-democratic "Left," ill-equipped to respond coherently to the threat of increasing economic inequality. Meanwhile, the historic advocate for the “common sense” concern about social and economic inequality – the Democratic Party – has increasingly been seen as more responsive to its elites’ primary preoccupation with cultural and moral issues than to labor's traditional social and economic concerns. FDR’s New Deal policies were admittedly less successful than it had been hoped they would be. (On the eve of the pre-WW II mobilization, unemployment - while down from what it had been when FDR took office in 1933 -was still 14%). But FDR’s New Deal policies did really help people. Perhaps even more to the point, they actually aided the victims of the Depression. President Obama’s policies, have also helped to some extent and certainly prevented the economic crisis from being even worse. But the aid went most noticeably not to the victims of the crisis (e.g., the unemployed, those being foreclosed out of their homes, etc.) but to the economic elite who, many believe, caused the problem in the first place (e.g., “bail-outs” to banks, Wall Street, etc.). It’s not just that the President and his economic “team” are wealthy, well educated people, who frankly don’t identify all that easilywith the day-to-day difficulties of those less affluent and less educated. There is indeed something to that argument, which would as easily apply to a very large part of the political class. It points to a fundamental dilemma for a democratic society of the prominent part played by money – and the values associated with the culture of money – in our politics . I suspect that the difference is part that President Obama (for all his evident good intentions and despite his admirable moral character) really is a “postmodern” President – the first, but probably not our last. Apart from adhering (fairly faithfully if not with complete consistency) to the cultural and moral preoccupations of the secularized intellectual elite with which he obviously identifies, he seems to lack clear ("ideological") convictions about some of the fundamentals of traditional political philosophy. Like so many of his contemporaries, he knows what cultural and moral beliefs are mandated by political correctness, and which are supposed to be considered and treated as self-evident truths. Beyond that, however, he seems pragmatically post-ideological, post-principle as a matter of principle. This to me may explain some of his awkwardness when it comes to articulating a convincingly principled alternative vision to his opponents’ ideological principles. September, when one finally feels that welcome first hint of autumn, always reminds me of Canada, where I spent 6 years form 1994 to 2000 - first as a deacon at the Catholic Information Centre (as it was then named) and then as a priest at our Paulist parish in Toronto. There, September 26 is the feast of the Canadian Martyrs - – Jesuits Jean de Brebeuf, Isaac Jogues, Antony Daniel, Gabriel Lalemant, Charles Garnier, Noel Chabanel, and Jesuit Oblates Rene Goupil, and Jean de la Lande – whom the US calendar commemorates on October 19 (under the title “North American Martyrs”). Their feast also always reminds me of the beautiful and popular shrine of the Canadian Martyrs at Midland, Ontario – and the perhaps even more significant historical site of the Jesuits’ 17th-cenury mission settlement of Sainte Marie that stands reconstructed in the shadow of the modern shrine church. It makes a great day trip from Toronto, and I remember well my memorable first visit there as a seminarian in 1984 with Paulist Father Jim Donovan and then later taking my own parents there in 1995. In its time, Sainte Marie was the westernmost European settlement in North America (north of Mexico) and surely qualifies as an integral part of that glorious early history – that epopee des plus brillants exploits of which the French version of the Canadian anthem sings so movingly. But for those Jesuit “Blackrobes” and their associates who lived and labored there - 37 days by canoe from Quebec City, spending long cold winters in smoky “longhouses” in Indian villages and the hot summers in that settlement, following their rigorous religious routine of prayers and spiritual exercises (starting daily at 4:00 a.m.), it was a rough obscure life. It only importance in worldly terms proved, paradoxically, to be its undoing, as conflict between the warring European Powers’ Indian surrogates forced the French Jesuits to leave that outpost after 10 years of intense missionary effort – abandoning what they had earlier built with such undoubtedly high hopes. At the time, the French Jesuits’ ambitious, impressive, powerful project appeared in worldly terms a colossal failure – as indeed, in the immediate shadow of the cross, must also have appeared the earthly mission of Jesus himself, in whose name those missionaries so heroically struggled. Now that North America is again becoming mission territory, we do well to keep such apparent failures as well as the seeming successes in mind as we consider anew how to re-establish the Good News in this New World. The familiar words we just heard from Saint Paul [Philippians 2:1-11] were written from prison to the Christian community Paul had founded and left behind at Philippi, to thank them for their generosity in the past and to encourage them to face the future. Who, though he was in the form of God did not regard equality with God something to be grasped. Rather, he emptied himself, taking the form of a slave … becoming obedient to the point of death, even death on a cross. Because of this, God greatly exalted him and bestowed on him the name which is above every name, that at the name of Jesus, every knee should bend … and every tongue confess that Jesus Christ is Lord, to the glory of God the Father. In direct and conspicuous contrast to typical, ordinary, normal, human behavior, Jesus was unselfish, humble, and obedient. In contrast to the typical, ordinary, normal, human self-centered narcissism, which dominates and directs most of human history (one need only look at Wall Street, but one need not even look that far), Jesus’ obedience has made it possible to undo that destructive pattern and alter the course of human history, by creating new possibilities for us, both in relation to God and to one another. Jesus’ obedience to his Father was not some isolated act. It was a total attitude that characterized his whole self. That was how God originally intended all of us to live. We cannot return to that original innocence; but, with God’s help, we can change course – like the first son in the parable in today’s Gospel [Matthew 21:28-32], who first answered, “I will not,” but who then afterwards changed his mind. It’s true, of course, that we cannot undo the past; and that we are in some sense always products of our past and may be burdened by our past. But the good news of the Gospel is that there is no sin that we can’t break away from. We cannot undo the past, but we can change course in the present, by remodeling ourselves in the image of God’s Son and so share in his new life – already here and now in the community of his Church on earth and then forever when our risen selves are joined with Christ completely in the kingdom of the Father. In telling us a parable about two sons, Jesus makes clear that he does not want us to focus forever on our first response, on our initial (and however often repeated) failure to follow; but rather to do like the first son and change. Let’s get going, Jesus is telling us, into that vineyard where his own life and example are leading us! Homily for the 26th Sunday in Ordinary Time, Immaculate Conception Church, Knoxville, TN, September 25, 2001. At 5:05 a.m. today, the sun made its annual passage over the equator, an alignment we call the autumn equinox - equinox, because as a consequence the entire planet purportedly experiences a day and a night of equal length, and autumn, because it heralds the season that serves as the transition from the heat of summer to the cold of winter. Seasons are natural phenomena, of course. On the other hand, how we choose to label and demarcate them is somewhat arbitary - arbitary in the narrower, literal sense of being a matter of some choice, not necessarily in the connotative sense of being completely a matter of whim. The old European "Celtic" calendar counted seasons as the period that surrounded the solar year's 4 cardinal dates (the 2 solstices and the 2 equinoxs). According to that way of computing things, autumn began on August 1, winter on November 1, etc. The medieval calendar reflected this with Lammas Day (until 1960 also the feast of St. Peter in Chains) on August 1, All Saints Day on November 1, Candlemas Day on February 2, and May Day on May 1. Our preferred way of computing the seasons starts with the solstice or equinox. Three of those dates became cardinal points not only of the natural solar year but of the liturgical year, giving us Christmas, Annunciaiton, and the Birth of John the Baptist of December 25, March 25, and June 24 respectively. Except for Christmas, those religious dates now pass virtually unnoticed now. Indeed, in our post-natural world of atificial lighting and climate-controlled homes and indoor workplaces, these seasonal changes mean so much less than they used to for our ancestors. So the solstices and equinoxes, while still acknowledged, signify relatively little for ordianry life in our resolutely post-natural world. (Of course, climate change and its attendant calamities could make us more sensitive again to the cycle of nature, but since we currently inhabit a political culture that seems hell-bent on denying both the reality and the consequences of climate change even that modest outcome seems unlikely, at least in the short term). Even so, some seasonal sensibility still sticks with us and still catches our attention. A week or so ago, I was watching a local news program where the lead item was an expected earlier-than-usual begining of the fall colors. While hardly the most pressing issue in the news, fall foliage is one of those vestiges of the natural world that still gets people's attention. While every season undoutedly has its particular charm, which deserves to be savored, my favorites are autumn and winter. Seasons happen naturally, but the symbolic human associations each season has come to carry are cultural creations. Thus, after the killing heat of summer, the autumn rains brought new life to Israel's desert climate and hence made fall the right time to begin a new year. In so many areas of life (schools, most obviously), fall remains for us the season of new beginnings and resumed activities. Already in the last week or so, the temperature has droped from the 90s we were still having at the beginning of September. If only it would drop further and really cool off! 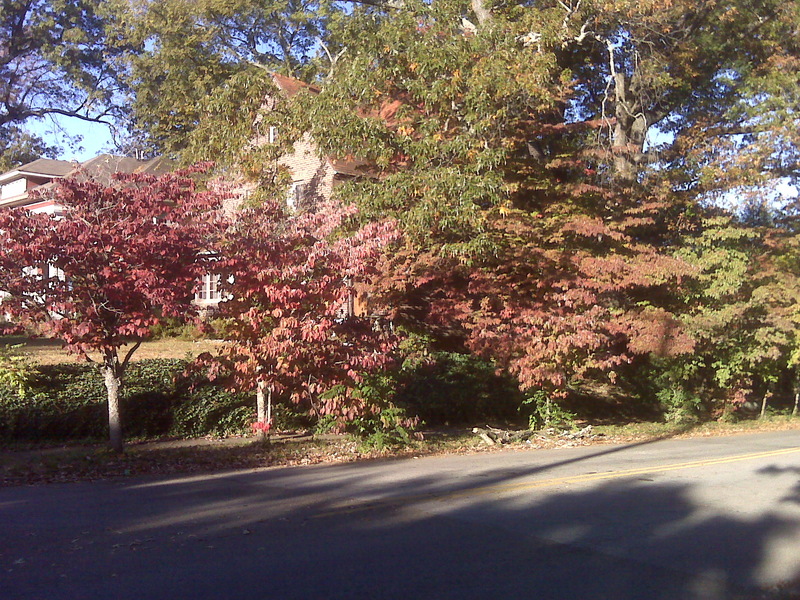 Then Fall could be experienced in all its glory! 'Each State shall Appoint ..."
Yesterday’s New York Times had an article about the latest instance of Republican trouble- making as we head into the 2012 election year. This involves a proposal in the Pennsylvania legislature to award the state’s electoral votes by congressional district (plus two at-large), replacing the long-standing “winner-take-all" method, that is in use in all but two small states (Maine and Nebraska). The theory, apparently, is that, while no Republican presidential candidate has carried Pennsylvania in decades, such a change would award the Republican at least some of the state’s electoral votes, thus reducing President Obama’s tally – and possibly even denying him re-election. Of course, the Pennsylvania legislature is legally entitled to do more or less whatever it wants in this matter. The Constitution leaves it up to each state legislature to determine hw a state’s presidential electors should be chosen: in such Manner as the Legislature thereof may direct (Article 2, Section 1). At the beginning, most electors were chosen by the state legislatures themselves, which was probably what the Framers themselves had expected. With the rapid democratization of presidential elections thanks largely to the quick development of organized political parties (something the Framers apparently didn’t anticipate and actually desired to avoid), the popular election of presidential electors soon became the norm. So also did the “winner-take-all” system – a system which, by and large, has served our country well. If nothing else, it has deeply entrenched our 2-party system (since it makes it so difficult for a 3rd-party or “Independent” candidate to win even a single electoral vote). For better or for worse, it has made carrying certain states more valuable than carrying certain other states, thereby structuring the orientation of presidential campaigns in certain predictable ways. Any change in the electoral process presumably always has a partisan purpose. Like campaign finance reforms, they also often have unintended consequences. Court-mandated legislative reapportionment in the 1960s, for example, was widely hailed by those who sought to increase the power of Democratic constituencies in cities. It ended up facilitating computerized reapportionment as a form of bi-partisan incumbency insurance. In the case of the currently proposed Pennsylvanian plan, one unintended consequence could be that Democrats (deprived of the traditional incentive to maximize turnout in urban districts, e.g., Philadelphia) might concentrate their resources instead in swing suburban districts – and in the process possibly unseat some Republican congressmen in those districts. Precisely such unintended consequences have always served as a prudential check on such partisan, short-term electoral tinkering. Such structural tinkering – electoral, or even worse constitutional – tends to bring out the Edmund Burke in me. Of course, even the constitution needs to be amended form time to time, but there is a good reason it has been done so rarely. Partisanship aside, it’s generally dangerous to subject inherited traditional institutions to too much rational analysis. That applies even to the (admittedly less-than-rational) inherited institution of the electoral college. It think it’s safe to suggest that, if the constitution were being written today, the electoral college would not figure in anyone’s plan. Likewise, if Canada were being created today, it perhaps wouldn’t occur to anyone to make it a monarchy. But countries and their constitutional arrangements are historical products, which have helped form their societies in specific ways. Hence, Canada remains a monarchy for good historical reasons, and U.S. Presidents are chosen by the Electoral College for somewhat less compelling but nonetheless good historical reasons. There is nothing remotely rational about how our electoral college functions – except that it has served us well. Admittedly, not only does it distort the popular vote, but on some occasions (1888, 2000) it has actually nullified it. That said, the system still has served us well on balance. Its elimination would severely undermine the present 2-party system, for example. Maybe having multiple parties has much to recommend it; but we don’t know how the benefits of a multi-party system could be enjoyed in a presidential system, where a parliamentary-style “coalition government” is physically impossible. And it could conceivably create even more gridlock, even more of a policy impasse than we already have – the solution to some theoretical problem somewhere, no doubt, but not to the problems facing us right now. (Nor should we underestimate the “legitimizing” effect of the electoral count in an era of closely contested popular elections – especially in our increasingly polarized and litigious society). In short, American society and politics have adapted well to how the electoral college (including the "winner-take-all" allocation of electors) functions. The best thing to do would be to leave it alone. It was Chesterton, I believe, who supposedly said that if it is not necessary to change, then it is necessary not to change. The success of any electoral or other political arrangement depends in significant part upon its predictability and moral legitimacy. Change challenges that. Partisanly motivated change undermines it that much more so. On September 19, 1886, Knoxville, TN’s Immaculate Conception parish dedicated its present church, the beautiful “Church on Summit Hill,” which has been the center of our parish’s life continuously without interruption now for these past 125 eventful years. At the time of its dedication in September 1886, the new church ended with the large arch that separates the nave from the present main altar area. The original church still stood directly behind it; but it was soon demolished, making possible the completion of the apse which includes the present high altar. (The Church’s three marble altars were installed in 1891). In a famous photograph taken on September 27, 1886, Immaculate Conception’s pastor and parishioners posed in front of the original stone church with the new church in the background. Of the parishioners in the photo, I believe that 24 have been identified by name. 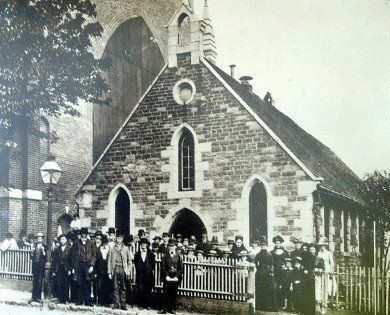 I love looking at that picture, which so powerfully portrays the Knoxville Catholic community of the time and shows their strong sense of identification with their parish church - built by their efforts and sustained by their commitment. The familiar photo highlights their justifiable joy in their accomplishment and their sense of responsibility for its future. That is why, 125 years later, we hope to repeat that 1886 experience with a new photograph to be taken in front of the main entrance of the church on West Vine Avenue immediately after the Solemn Anniversary Mass of Thanksgiving on Sunday, October 23. 101 years ago, as the King of one of the world’s Great Powers was about to die, his Queen sent for the woman she knew he really loved to be with him at the end. This gesture attracted a lot of attention and was much commented on at the time. The Queen was actually almost deaf, but she heard them and is said to have commented in reply that jealousy is the source of so much misery in the world. Today’s gospel [Matthew 20:1-16a] also confronts us with the complex dynamic of generosity and jealousy. Jesus’ parable portrays both generosity and jealousy – the infinite generosity of God and the limited (and limiting) jealousy of people (particularly those who mistakenly think they have somehow earned some special sort of credit with God). One of the problems with Jesus’ parables, of course, is that , having heard them all so many times, we already know the ending, and so can’t experience the shock such parables originally produced – and intended to produce – in their hearers. Jesus in this parable shocks his hearers with God’s great generosity, which liberates people from their rivalries and jealousies and establishes a new relationship among God’s people. The point, clearly, is God’s overwhelming generosity which transcends all claims of human merit or accomplishment. The social world of the parable is that of the middle-eastern landowner hiring short-term day laborers during the harvest – much as many migrant workers are often hired in our country today. The contrast between how the parable ends and our ordinary world where the poor and vulnerable are more likely to be exploited – especially if they re immigrants - could hardly be more dramatic, another reminder, if one were really needed, that the kingdom of heaven has its own rules, which don’t necessarily correspond at all to what we think is important in our ordinary earthly lives. Just as the owner of the vineyard challenges the workers in the first group to accept a radical equality with those in the last group, Jesus challenges all of us to recognize that no one of us has any claim or qualification to rank others in God’s sight. Of course, the workers in the first group grumbled. Envy and jealousy are second nature among us, and our grumblings reflect our easy entrapment in ourselves and in our own jealousies. In the parable, God’s generosity – such a liberating surprise for the workers in the last group – becomes paradoxically a source of disappointment for those who mistakenly think their efforts have somehow earned them some special claim on God. Obviously, this parable had a very special significance in the 1st-century Church both for the Gentile Johnny-come-lately converts to Christianity and for the Jewish Christians who were being challenged to accept them on equal terms. From the safe distance of 20 centuries, it seems easy for us (who, after all, are the beneficiaries of those Gentiles having been accepted as equals in the Church) to think that outcome was obvious or automatic or inevitable – this ignoring what a challenge it must have been for the Jews, the first hired, who’d already borne the day’s burden, ignoring also its challenge to us today to avoid feeling some similar sense of entitlement, as if that were all only ancient history. It wasn’t that long ago, after all, that Italian-speaking Catholics were sometimes assigned to the basement in certain big-city parishes, and even more recently that other, newer immigrant groups have had to struggle to find a full welcome in some of our churches. There is a reason, of course, why the Church is called Catholic, a Greek word for "universal." The Church is the original “Big Tent.” It includes not just Gentiles as well as Jews, but poor as well as rich, the sick as well as the healthy, the uneducated as well as the cultured elite, the old as well as the young, the ugly as well as the beautiful, and so on. Jesus says the kingdom of heaven is like a landowner who went out to hire laborers for his vineyard. The landowner’s repeated forays into the marketplace were because had an important task to get done. He had a harvest to bring in. The good news of the Gospel is that making God’s kingdom happen is always God’s priority – and not the things that we care about. The bad news of sin is that, instead of making God’s kingdom happen, our priority is more likely to be ourselves. The challenge of the Gospel is to respond to God with gratitude instead of envy, conducting ourselves (as St. Paul says) in a way worthy of the gospel of Christ, and so doing our part to make the kingdom happen here and now. 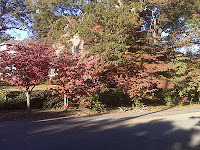 Homily for the 25th Sunday in Ordinary Time, Immaculate Conception Church, Knoxville, TN, September 18, 2011. For the first 18 years of my life, one of the most distinguishing marks of Catholic life was abstinence from meat on Fridays. The Catholic calendars that parishes distributed every December (paid for, typically, by the local funeral home) usually had a fish superimposed on the numeral each Friday of the year (apart from the occasional holyday) and on certain other days (e.g., Christmas Eve) as well. There were also several “partial abstinence” days (suitably marked with a half fish). The fish still reappear in contemporary Catholic calendars during Lent, but basically the long-standing custom of Friday abstinence (along with the more onerous requirement of Lenten fast) just disappeared in the late 1960s, along with so many other good and worthwhile things. The theory behind the change seemed to be that Friday abstinence was hardly all that burdensome anyway and that Catholics could choose other more personally appropriate forms of penance. 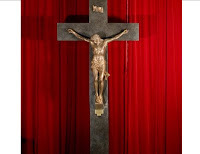 The idea was that the obligation to practice penance in one’s life remained, and that the Church expected Friday to continue to be kept as a weekly day of penance and Lent to continue to be kept as an annual season of penance, but that people would be free to substitute their own appropriate acts of penance in place of abstinence. That may have been the theory, and I am willing to stipulate to the sincerity of those who promoted it. The reality, of course, as Catholics actually experienced the change, was something quite different. Coming right in the middle of a period of unprecedented liturgical experimentation and wholesale ferment in both Church and society, this seemed like just one more change chipping away at any idea that the Church somehow transcended the immediate spirit of the age. Whatever the theoretical mandate to practice penance and asceticism in one’s life, the signal sent seemed to be that self-denial (even in so modest and easily accessible a form as Friday abstinence) was obsolete. It coincided perfectly with the prevailing culture’s move in an increasingly narcissistic direction. Lastly, it abolished a clear marker of Catholic identity – precisely at a time when the Church seemed to be losing confidence in its competition with contemporary culture and the Catholic faithful so desperately needed an affirmation (rather than a negation) of their distinctive Catholic identity. While that argument may be dismissed by some as a largely “cultural” concern, the fact remains that some sort of distinctly identifiable Catholic culture is essential for a vibrant internal Catholic community life and for any effective outward evangelizing mission. Growing up in New York, I was well aware of the importance of keeping kosher for Jewish identity, how it intruded religion into the otherwise secular day-to-day. More recently, we have all become aware of how the practice of Ramadan is to Muslim life. Such practices remind their practitioners of who they are and how that requires them to be different from the rest of the world. Even the liberal commentator Father Andrew Greeley seemed to see in the abandonment of Friday abstinence a loss to Catholic identity. Then add to that the loss of any distinctly ascetical dimension to contemporary Catholic life, thanks the loss of our Catholic tradition of periodic penitential practices! As of today, the Bishops of England and Wales have reintroduced the practice of Friday abstinence into the even more secular society of the United Kingdom - an apparent recognition that its abandonment only added to the difficulties of maintaining a lively Catholic identity in modern Britain. There are many challenges facing the Church in today's world, and this is only one small move, but the English and Welsh Bishops are to applauded for making it. Tuesday's special election in New York's 9th District (to fill the vacancy created by the resignation of Anthony Weiner) has been a bonanza for political pundits and analysts attempting to read the tea leaves of 2011 to predict 2012. Political prognostication is risky business, as anyone knows who remembers, for example, the 2008 presidential election that was supposed to pit Hillary Clinton against Rudy Giuliani. The evident lure of predicting the future, however, seems generally to outweigh the risks. (The real risks, let it be noted, are not to the reputations of the pundits and analysts who, like meteorologists, manage to sail from erroneous prediction to erroneous prediction with their reputations largely intact. The real risk is the damage done to our political system from the artificial effects such problematic predictions have on the actual process by which we choose our presidents). The popular aphorism that "all politics is local" applies universally - except when it doesn't. Undoubtedly, there were genuinely "local" factors influencing Tuesday's outcome. Much has been made, for example, of the alleged weakenss of the Democratic candidate and his campaign. Not being on the scene myself and not having much followed the campaign I really can't comment on that, except to recall that a similar excuse was invoked in Massachusetts after Republican Scott Brown defeated the Democratic candidate for the late Ted Kennedy's vacant seat. On the other hand, there may be something to that argument - especially in this case where the candidate had to be someone already resigned to the fact that he would probably be redistricted out of office at the end of his term. The line between a reason and an excuse is inevitably a fine one, however. There is another political aphorism that also applies universally - except when it doesn't. "It's the economy, stupid." Voter discontent with the state of the economy is widely alleged to be President Obama's Achilles' Heel as he approaches 2012, and Tuesday's outcome cannot but add to the Democrats' anxiety in this regard. That anxiety must be especially acute given the utter irrationality of the diffuse anger about the economy and the vitrual inability of the President to accomplish any major improvement in the economic climate between now and next year's election. Even were the Republicans to cooperate and pass the legislation the Preident has proposed, the short-term benefits might still be meager. The President can, of course, be faulted for his Administration's apparent indifference to unemployment earlier on - some of which might be blamed on the elite character of the President and his economic team, which perhaps caused them to react too slowly and with insufficient energy to the economic concerns of so many ordinary Americans. Even so, it can only be the height of irrationality to punish President Obama for that by voting for an opposition party whose priorities and likely policies would make the the lives of ordinary Americans even more precarious. Since I am quoting aphorisms today, I'd say protesting the bad economy by voting Republican would have to count as a classic case of "cutting off one's nose to spite one's face." But, then, "it's the economy, stupid" only except when it isn't. There are other things people care about. And one thing a lot of people in the 9th District do care about is the security of Israel. Unlike the case with the economy, using one's vote in a congressional race to send the President a message about his misguided approach to the Middle East might be very rational. For one thing (again unlike the case of the economy) there are things the President actually has it within his power to do to support Israel in the coming U.N. session - e.g., the U.S. can veto in the Security Council any resolution acknowledging a purported Palestinian statehood, and can counteract whatever support the General Assembly may give by strongly supporting Israel in punitive measures against its Palestinian enemies. The veto, at least, would be likely in any case. But elections do have a way of focusing politicians' on what people care about, and so this otherwise irrational 9th District outcome might serve at least one very rational goal of steering the Administration from what seems to be its problematic default position in matters Middle Eastern. A lot can - and will - happen between now and the 2012 election. The 9th District may - or may not - be a harbinger of things to come. Time will tell. Meanwhile, there are lessons to be learned; and blaming the outcome on a weak candidate or uniquely local factors should not be one of them. Ten years ago today, St. Paul the Apostle Church in New York (where I was serving at the time as Associate Pastor) was filled to overflowing in response to President Bush’s call for a national day of prayer after the terrorist attack on our country just three days before. Undoubtedly, other churches all over this land were likewise filled that day in response to that same summons. On that unforgettable September Friday, we were a nation in mourning and a city still in shock. But, when we assembled there in that beautiful church, we did what we as Church always do on the 14th of September. We celebrated the Exaltation of the Holy Cross, a timely reminder that, while human life is inevitably lived in what the Church’s Night Prayer calls a “vale of tears,” Christian life is also always lived in the paradoxical triumph of Christ’s cross. Historically, this feast commemorates the dedication, on September 13, 335, of the Basilica of the Holy Sepulcher in Jerusalem – built by the Roman Emperor Constantine on the traditionally recognized site of Christ’s death, burial, and resurrection. (That same Constantine had, 23 years earlier, supposedly seen a vision of the Cross - along with the words “in this sign you will conquer” - on the eve of the decisive military victory which made him sole Emperor of Rome). The day after the basilica’s dedication, the relic of the True Cross (discovered by Constantine’s mother, the Empress St. Helena, in 320) was publicly venerated in the new basilica, and so September 14 became the feast celebrated today throughout the Universal Church. Thus, this feast can be seen as a celebration of Christianity’s triumph over Roman paganism. (The date for the dedication of the Jerusalem Basilica was likely chosen to counteract the anniversary of the dedication of the Temple of Jupiter in Rome - ironically now the site of a monument to the triumph of secularism, united Italy’s 1911 monument to King Victor Emmanuel II). Ultimately, however, what we celebrate today is Christ’s triumph over our sad human history of evil and sin and their countless consequences in the seemingly endless sufferings and tragedies that continue to break our hearts – now transformed once and for all through the triumph of Christ’s cross. Evil and sin do not happen by accident – and neither did the cross. 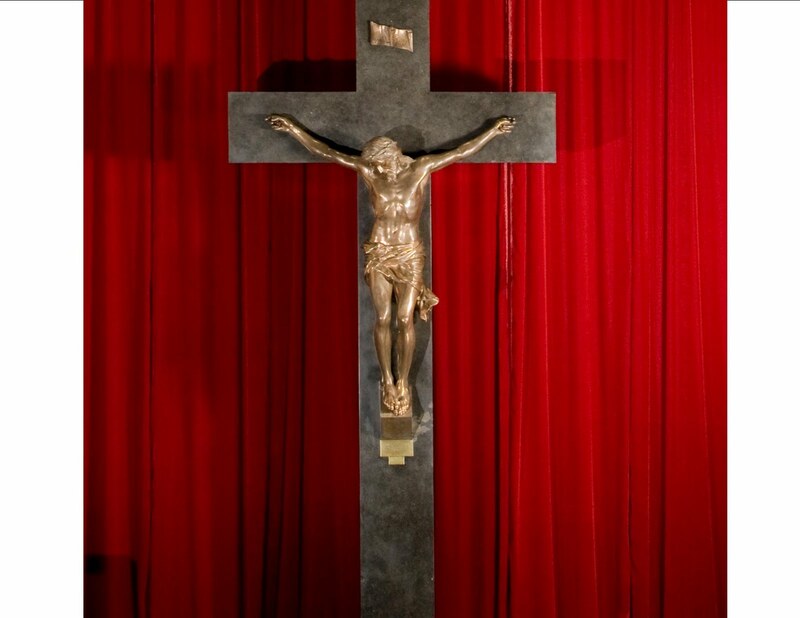 It didn’t just happen to Jesus one day, like some inexplicable misfortune (events which, when they happen in our own lives, we may all too glibly refer to as “crosses”). Christ’s cross was a direct consequence of Jesus’ redemptive mission – a direct consequence of his confrontation with evil and sin in the world. The mystery of the cross challenges us to turn away once and for all from our dead-end focus on ourselves, so that we may journey through this treacherous life without fear, under the sign of the cross, which alone can conquer in our war-torn terrorized world. Homily for the Feast of the Exaltation of the Holy Cross, Immaculate Conception Church, Knoxville, TN, September 14, 2011. In Washington, DC, 25 years ago today, Paulist Father Jim Young died after a short illness. He was only 46 years old, still seemingly in the prime not only of a vigorous life but of a distinguished priestly career. A Philadelphia Irish Catholic, Jim had entered the Paulists in 1960 and was ordained a priest in 1967. He’d ministered at Chicago’s Old St. Mary’s Parish and Boston’s Park Street Paulist Center and at the Weston School of Theology, and was nationally known for his pioneering work in outreach to Divorced Catholics. From 1978 to 1986, he served as Director of Formation and Superior of the Paulist Washington Community, the role in which I came to know him. Jim was Director of Formation my entire time at St. Paul’s College, and was also my personal Formation Adviser. Jim was a1960s liberal. Raised and formed in the vibrant, urban, ethnic, pre-conciliar Church, he was part of that aggiornamento generation that had eagerly embraced change and was pushing in new directions. But Jim was also a liberal in the good sense that he was someone secure enough to be open to and accepting of others, and so free from the rigid intolerance of any political incorrectness, whether in politics or in religion, that is so often found in liberalism today. No doubt, it was precisely that open and accepting character that enabled him to recognize the varied gifts and differing talents of the seminarians he governed. He saw value in me, when certain other prominently placed Paullists did not. His approach seemed to be to try to discern what gifts and talents a particular student might have to offer and how that person might serve effectively and well as a Paulist priest. Even in the perennial battleground that was the liturgy at that time, he once remarked that what he called a “campus ministry” style of liturgy was not the only legitimate option and that it was perfectly proper for a Paulist to prefer a more traditional and elevated form of worship. Jim was an optimist, whose joy in his own ministry was not only evident but infectious. It permeated the environment at St. Paul’s College in the early to mid-1980s. Undoubtedly there were flaws in the formation program, which was obviously enough a creature of its time; and there were things to be challenged and corrected. But the overall atmosphere at St. Paul’s College in my time was positive. As individual seminarians, we all had our ups and downs, and some left. But for most of us, I think, it was a good and growing experience of what is nowadays called “human formation.” Overall it was happy place – a good and relatively safe place to get to know oneself and others and God. We were a small group compared to the numbers that building had been built to accommodate, but we were a large group compared to the smaller formation community of more recent years. And the building helped too – creating community by forcing us to spend much more time together than the radically renovated contemporary building does. There may be something to be said for having to shave next to each other every single day! I left St. Paul’s College to begin my diaconal assignment on February 7, 1986. The only time I saw Jim again was the following May at the Paulist ordination in New York. I remember how he smiled when he saw me at the pre-ordination festivities and how happy that made me. Looking ahead to my own ordination (which I then expected would be happening one year later), I wrote to ask him to preach at my First Mass and received a nice card from him promising to do so. When he became ill later that summer, I called him in the hospital. Apparently as yet unaware of the gravity of his illness, he told me he expected to have to return to St. Paul’s College to convalesce before moving to his new assignment in San Francisco. Not being in Washington myself, it was only in his final days that I learned how seriously sick he really was. By the time I returned to Washington to attend his funeral, I already knew that I would not be ordained a priest the following year and so found myself mourning not only a good friend and mentor but also the vocation he had so supportively encouraged me in. Wrath and anger are hateful things, yet the sinner hugs them tight [Sirach 27:30]. Jesus ben Sirach wrote those words early in the 2nd century B.C., but his observations seem as pertinent today as they were then, his conclusions as true today as they were then. All of us, individually and collectively, surely have had our share of experience with wrath and anger, and have certainly seen their consequences. Being sinners, as we all are, we may also, in our own lives and in our own behavior, also have hugged wrath and anger all too tightly, whether for our own good or the good of the world. Ten years ago, we witnessed, we lived through, wrath and anger at their worst, as the sunny serenity of an absolutely beautiful late summer New York City morning was suddenly transformed into an experience of horror beyond anything most of us had ever imagined we’d see so close to home. At that time, I was an Associate Pastor at St. Paul the Apostle Parish (the Paulist “Mother Church”) in New York City. After Mass and breakfast, I walked to John Jay College to vote in the Primary election for Mayor. Walking home, I looked at the perfectly blue, cloudless, late summer sky and observed that, on such a beautiful day, I should force myself to get out of the building long enough to spend some time in Central Park later in the day. When I got to my office, my fellow associate startled me with the news of an accident (as it was initially then thought to be) at the World Trade Center downtown. I walked back to the rectory to turn on the TV to catch the news, and then “in real time” (as we now say) watched, with ever escalating horror and anxiety as (to use yet another cliché of that day) “everything changed.” And how quickly, everything changed! Already at 8:45 the North Tower had been struck and soon at 9:03 (precise times indelibly engraved in one’s memory) the South Tower would be struck. Our country was being suddenly and savagely attacked, and we all got to see the ugly face of evil in a way my generation had never really experienced it before. Soon, even the corner Starbucks shut down, as police barricades went up, closing our street to regular traffic. From the seemingly self-enclosed world of an assisted-living facility in Brooklyn, my 99-year old aunt telephoned, concerned for the safety of those she knew in Manhattan. For days that stretched into weeks, we went around in a daze, past churches and firehouses draped in black, past posted pictures of missing persons who would never be found, staring at the vacant place in the skyline, as military jets patrolled the now grimly gray, but otherwise empty sky. We watched over and over again as TV told and retold the story, punctuated by occasional accounts of heroic courage and poignantly loving final conversations – powerful lessons not just about how to face death, but how to live a life that makes sense. From earliest times (and down to today in the Church’s daily prayer and in every Mass), the Church also has honored the memory of the dead and offered prayers on their behalf. St. Monica famously said to her son St. Augustine: “I ask only this of you, that you remember me at the altar of the Lord, wherever you may be.” So, besides being a fundamental and universal human need, remembering the dead is also a religious duty, that expresses our faith and our hope. Meanwhile, of course, life goes on. The world, with its seemingly intractable social and political problems and conflicts continues to challenge us. The scriptures we just heard do not directly address the many social challenges and political policy choices which our nation now faces and will continue to face in the future. They do, however, say something very important about who God is, what kind of relationship God has chosen to have with us, and what kind of people we are being called by God to become. So we are assembled here today – as every Sunday. We come as individuals each bringing his or her own worries, fears, and hopes, and also as citizens collectively concerned the security of our country, conscious – as world events continue to remind us – of how perilous life can be and how fragile the network of social bonds on which we depend for our survival. But, also and above all, we are assembled here in this holy place, in this our parish church, around this sacred altar, as members of the Body of Christ, whose own death and resurrection teach us that death no longer has the last word in our world and so challenge us to follow him and so find love in a hate-filled world. Homily for the 10th Anniversary of 9/11, Immaculate Conception Church, Knoxville, TN, the 24th Sunday in Ordinary Time, September 10, 2011. Tomorrow marks the 10th anniversary of the terrorist attacks on the United States, an event now almost universally referred to by its numerical date – “9/11.” I suppose we all have our own uniquely personal memories of that day. At the time, I was an Associate Pastor at St. Paul the Apostle Parish in New York City. Tuesday, September 11, 2001, began beautifully. After Mass and breakfast, I walked over to John Jay College to vote in the Primary election for Mayor. Walking home from voting, I looked up at the perfectly blue, cloudless, late summer sky and observed that, on such a beautiful day, I should force myself to get out of the building long enough to take a nice walk in Central Park later in the day. (It seems almost everyone, when recalling that morning, remembers what a beautiful blue sky it was). When I got to my office, my fellow associate startled me with the news of an accident (as it was initially then thought to be) at the World Trade Center downtown. I went back to the rectory to turn on the TV to catch the news, and then “in real time” (as we now say) watched, with ever escalating horror and anxiety as (to use yet another cliché of that day) everything changed. Meanwhile, my scheduled Saturday wedding went on as planned – followed, however, on Sunday by a Prayer Service for the lost at a neighborhood firehouse. And then, we mourned, For weeks, we were a city of funerals. Filled to capacity on that first Friday of national mourning, the Paulist Church in New York mourned as part of one united nation. A few days later, our church was filled again, this time in mourning for a much loved member of the parish choir, who had perished in the heroic struggle to recapture United Flight 93. Ten years have since passed. In a threatening and insecure world of warring nations and clashing civilizations, we have been reminded, once again and ever so seriously, that the benefits of human community and civilized life do not come free or cheap, and that the challenging social and political imperatives of domestic and international security and peace are a permanent part of the human picture and demand our attention and intelligent engagement. It is indeed by the grace of God that we will gather on Sunday, September 11 - as we do, Sunday after Sunday, by the grace of God – not, however, the god of playwrights and philosophers but the God who has spoken to our world, once and for all, in his Son Jesus and who now challenges us to follow him into his kingdom, touching deaf ears to hear his words and mute mouths to proclaim the faith that makes hope possible. Well, the President finally got to deliver his speech – a day later than he’d originally hoped and a few hours earlier than any sensible schedule would have suggested – in that case to accommodate those for whom watching NFL football is more important than learning what our elected leader proposes to do about unemployment. That peculiar conundrum certainly speaks volumes about the sad state not just of our politics but of our entire society!However that may be, the speech took place – before a Join Session of Congress with all the pomp (and pomposity) that goes with that. As I listened to the President’s words and watched who applauded and how often and who applauded and stood up and how often, I thought it was a good speech – not just for making concrete proposals at least some of which might actually have some prospect of passage but also for making the case for government. Alexander Hamilton might have made the case better himself, but Alexander Hamilton (sadly) is not our president, and I think Hamilton would have vigorously applauded (and even applauded and stood up) as the President reminded the nation (albeit a nation that would still rather be distracted by football) of why we have government and how much we need it.The Opposition Party – or at least its nominal leadership – not only wisely chose to forego the ridiculous practice of giving a televised response but actually seemed to suggest they might act the way citizens have traditionally expected legislators to act. Thus, the Speaker of the House, Rep. John Boehner, in a statement released soon after the President’s speech said: “The proposals the President outlined tonight merit consideration. We hope he gives serious consideration to our ideas as well. It’s my hope that we can work together to end the uncertainty facing families and small businesses, and create a better environment for long-term economic growth and private-sector job creation.” And Republican leader, Eric Cantor, echoed the Speaker, saying: “There are certainly goals the President outlined that we can work with him on. We should work quickly to pass the areas where we agree.”Perhaps most promising of all, however, was the President’s promise/threat: “You should pass it. And I intend to take that message to every corner of this country." Not quite Harry Truman yet – but maybe getting there? It’s the custom here at Immaculate Conception, Knoxville, at the end of Sunday Mass to ask who is having a birthday during the coming week. 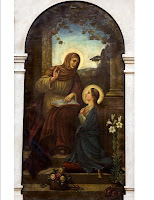 At the Saturday evening Mass this past weekend, someone reminded the congregation that included among this week’s birthdays is that of the Blessed Virgin Mary. Indeed, Mary’s birth has been celebrated liturgically on September 8 since at least the 5th century. Obviously we have no idea what day Mary was in fact born. 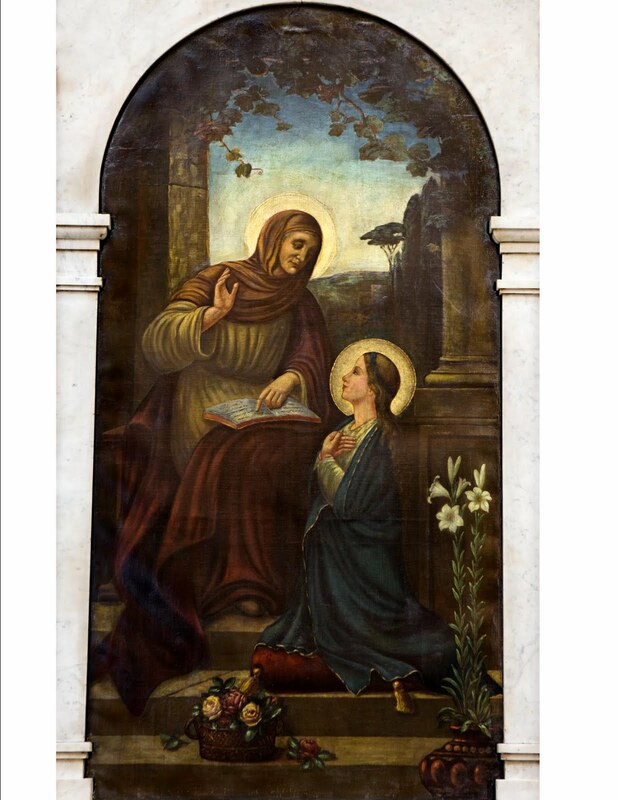 September 8 is actually the anniversary of the dedication of an ancient church in Jerusalem in honor of Saint Anne, Mary’s mother, on a site popularly associated with Mary’s home. Whatever the merits of that particular geographical tradition, Mary’s birth has long been celebrated on this date – one of only 3 birthdays celebrated in the liturgical calendar (the others being those of Jesus himself on December 25 and St. John the Baptist six months earlier on June 24). Since the scriptures give us no information whatever about Mary’s birth, the liturgy today gives us on Matthew’s account of Jesus’ ancestry. That is, as one would expect, a patrilineal account that traces Jesus’ descent from Abraham through David to Joseph, Jesus’ legal father; but which, less expectedly, also mentions four mothers (Tamar, Rahab, Ruth, Bathsheba) in the case of each of whom there was something out-of-the-ordinary about the circumstances of her participation in Jesus’ geneology – culminating in a fifth mother, Mary, who would conceive in an even more out-of-the-ordinary manner. Celebrating Mary’s birth, however, takes us back to before Mary’s miraculously virginal conceiving of Jesus, to a physically much more ordinary seeming event – an almost invisible event which nonetheless somehow summed up centuries of human expectation and hope, all fulfilled finally in this one woman who would truly become what Eve was meant to be, the mother of all the living (Genesis 3:20). How fitting that we celebrate this at what is in all but name the functional beginning of the year - when we start up again all our school and community activities after the interruption of summer! In fact, for 21 consecutive years - from 1947 to 1967 - it was also the Paulist Fathers' practice to celebrate religious profession on this feast. Our society long ago ceased to mark its months and dates by reference to the Christian calendar. Apart from the devout remnant who frequent daily Mass, few will likely note the occurrence of the feast of Mary’s Birth. Be that as it may, it deserves our attention, as it fittingly graces the beginning of a new cycle of annual activities. Therefore, let all creation sing and dance and unite to make worthy contribution to the celebration of this day. Let there be one common festival for saints in heaven and men on earth. Let everything, mundane things and those above, join in festive celebration. Today this created world is raised to the dignity of a holy place for him who made all things. The creature is newly prepared to be a divine dwelling place for the Creator (St. Andrew of Crete, 8th century). Fifteen years ago today, one of the Paulist Fathers’ eloquent 20th-century mission preachers died. James Finley, CSP, was 81 years old when he died, and his active preaching days were long behind him. Indeed, that whole Catholic world that had provided the rich connotative context for much of Jim Finley’s ministry was itself already long gone. It was already gone when I first met Jim at my first evening meal at the Paulist Novitiate on August 24, 1981. Jim was by then living in retirement at Mount Paul, pursuing his private activities (some writing, some retreat ministry, etc.). He lived in a simple suite of rooms on the second floor, down the hall from the priests’ common room. Generally, we saw him only at dinner. Having come out of his room (or returned from whatever he might have been doing elsewhere), Jim socialized with his brother priests in their cozy common room, then came downstairs with them for dinner with us novices. One month into our novitiate, Jim gave us a “Day of Recollection.” Later he would give us individual preaching coaching. An assertive man with strong opinions, Jim quite consciously adopted a somewhat diffident stance in the novitiate – involving himself with us and our formation only to the extent that such involvement was welcomed by the novice master. Fortunately, my novice master seemed quite happy to invite Jim to coach us in our bumbling first efforts as preachers and to be a significant personal presence in our small novitiate community. During my Washington years, I returned to visit Mount Paul on occasion and always enjoyed the opportunity to knock on Jim’s door and spend an hour or more chatting with him in his room. After my 1986 catastrophe, those visits became more frequent and even more appreciated. From 1987 to 1994, I was based in New York – first at Good Shepherd, then at our 59th Street Mother House. More than just a pleasant pace to spend a day off, Mount Paul became one of my places of personal refuge, where I felt welcome (thanks to the kindness of my novice master and his successors) and somewhat “at home” (in a way I could never feel, for example, in the renovated St. Paul’s College). The awkwardness of my anomalous status accompanied me, of course, wherever I went – no less so at Mount Paul. But, whereas I would scrupulously avoid the both the priests’ common room and the students’ common room on the rare occasions when I visited Washington (acutely conscious of not really belonging in either place), I always felt welcome both in the upstairs common room at Mount Paul and in Jim’s “office.” I cherished chatting with Jim about my life – and how I was coping with its anomalies – and appreciated that he liked me enough actually to care about how I was doing. After ordination in Toronto in October 1995, I flew to New York for “First Masses” on consecutive Sundays at St. Malachy’s and Good Shepherd. During the week in between, I visited Mount Paul and, while there, was invited to celebrate Mass in the novitiate chapel. It was November 9, the feast of the Dedication of St. John Lateran. To everyone’s surprise, Jim showed up in the congregation. As he said to me afterwards, “I don’t usually do this, but I’ve waited so long for this day.” It was a small gesture, to be sure, but one that touched me immensely. His health started deteriorating significantly during the subsequent months. When I was in New York for vacation the following summer, I drove to Oak Ridge to see Jim for what turned out to be the last time. Experiencing him as we did at Mount Paul, one could easily forget (or possibly not even know) about his “active” years. Besides preaching, he had served the community as Vicar General and had written on preaching, on senior spirituality, and – most famously, I suppose - a Paulist biography, Guardian of America: The Life of James Martin Gillis. Aware of all that, I sometimes felt for him in his seemingly hidden away retirement. But much more than whatever he had done in his active career, what mattered most to me were his personal kindness and his genuine interest in my fate. Requiem aetarnam dona ei, Domine; et lux perpetua luceat ei. If our civic holidays were still the civic holidays they were created to be – as opposed to being just opportunities for shopping or other diversions – then this Labor Day would be a sad holiday indeed. In the current economy, a day devoted to the well-being and progress of the American worker would have to be observed more appropriately as a Day of National Mourning. Young people trying to enter the labor force today have no contrary experience and may automatically assume their opportunities will be fewer and their standard of living less than those of their parents, but it was not always so. And, if it was not always so, then it need not have become so either! As a “Baby Boomer,” who grew up in that great post-World War II quarter century or so of unprecedented nation-wide across-the-board prosperity, I know that the present era of increasing economic inequality and the progressive deterioration of American middle class life is not how it used to be and not how it had to be. Around the time I was born, the top 1%’s share of national income was about 12-13%. It more or less kept declining until it reached an all-time low of 8.9% in 1976, after which it started rising again to the point where we are now virtually tied with 1928 (the year before the Great Depression) when the top 1%’s share peaked at 23.9%. During what former Secretary of Labor Robert Reich has called “The Great Prosperity,” American workers’ wages and productivity rose in tandem. Over the last 30 years, however, the period Reich labels “The Great Regression,” productivity has continued to rise, while wages have stagnated. One of the classical axioms of traditional political theory is how non-authoritarian political arrangements generally presuppose and seem almost to require a relative equality among citizens. While some degree of inequality is inevitable and may even be desirable, inequality is only desirable within certain limits, beyond which the moral foundation of society falters. Modern liberal political theory (e.g., John Rawls) attempted to delineate what degree of inequality and its attendant consequences would be consistent with liberal democratic legitimacy. By those standards, our society is certainly in bad shape. An economic theorist like Reich argues (as he did again in yesterday’s NY Times Sunday Review) that a revival of our economy must also presuppose progress on the equality front, for our stagnant middle class can no longer spend enough to generate sufficient demand. Augmenting the purchasing power of the middle class, he argues, is essential for further economic growth. While all these points seem obvious enough, what remains lacking is any semblance of political will to reverse this depressing situation. While we now can clearly see the results of the policies of the past 30+ years (going back to the initial de-regulation moves of the Carter Administration), as a society we are hopelessly divided – a division that is both reflected in and exacerbated by the polarization among our competing political elites. On one side are elites eager to continue and expand policies aimed at increasing inequality. Besides genuine free-market and libertarian ideologues, they include those whose private interest has benefited (to the detriment of the common good) from such policies as low marginal tax rates for those at the top of the income scale. They also rely for political support on others, who, while not benefitting directly from increasing economic disparities, have come to identify the proponents of such policies because of their overriding moral and cultural concerns. On the other side are elites who see the situation for what it is and can appreciate the arguments for trying to stimulate the economy by policies favorable to diminishing income inequality. Such elites, however, have also largely identified themselves with (or at least have become identified with) a complex collection of moral and cultural values increasingly alien to those of many ordinary Americans. Adherence to this rigid set of secular moral and cultural values increasingly defines the politics of what now passes for “liberal” or “progressive.” The fact that they themselves tend to be among the more privileged classes further gets in the way of any ability to identify with the concerns of ordinary Americans. Thus, arresting the decline of the middle class just can’t get the same traction among “liberal” or “progressive” elites as their social class’s aggressively secular moral and cultural agenda. Meanwhile, the economy continues to atrophy, and more and more people are increasingly worse and worse off, while hope in the future (once the hallmark characteristic of American culture) is withering. "If Your Brother Sins Against You ..."
To anyone raised in the English legal tradition, today’s Gospel almost has a kind of “due process” sound to it. Some years back, when I was stationed in Canada and this Gospel came up, someone suggested preaching wearing a wig and holding a judge’s gavel, to which I replied that in my case a wig would certainly be a good idea. Be that as it may, it is indeed a “due process” kind of Gospel – this procedure Jesus outlines to deal with conflicts within the community of the Church. But it is a very particular type of “due process.” Obsessed as we are in our society with individual rights, when we speak of “due process” typically what gets emphasized is the legal protection of the rights of the one being accused (or, in this case, “challenged” might be a better word than “accused”). The “due process” Jesus outlines here does do that, but more importantly it is a process aimed at reconciliation. In that regard, it reminds me of the process in canon law for dealing with problem people in religious communities. The problem member is warned and given a chance to change several times before the process ends in expulsion. That’s because the goal of the process is not expulsion but rather the person’s reconciliation with the community. Expulsion may end up being necessary, but always only as a last resort - as it is in the process Jesus outlines in today’s Gospel. Only after 3 tries – individually, in a small group, and finally involving the whole community – is the person excommunicated. Even then, however, the story doesn’t quite end there. The excommunication prescribed by the procedure Jesus outlines is specified as: If he refuses to listen even to the church, then treat him as you would a Gentile or a tax collector. Now, in the ordinary world, the meaning of that would have been perfectly clear. Devout, observant Jews avoided (as much as possible) having contact with such people, and they certainly would not admit them to their homes or eat and drink with them. Yet, when Jesus says treat him as you would a Gentile or a tax collector, he seems to be muddying the waters a bit, because – coming from him – there is a certain nuance to that, because of course we can all recall how Jesus himself treated Gentiles and tax collectors. Such people may indeed be outside the community, and they may in fact (as they clearly are in this case) be outside because of their own bad behavior, but they’re not forgotten. In the divided, highly conflicted North African Church of the 4th century, St. Augustine (354-430), speaking of the heretical and schismatic Christians he had to oppose so vigorously, said: “My friends, we must grieve over these as over our brothers. Whether they like it or not, they are our brothers” [Commentary on Psalm 32 (33)]. So it is hardly surprising that the Church has always recognized reconciling wanderers back to the mainstream of the Church as one of the Church’s constant concerns. Canon law specifically mentions as one of the duties of pastors “to make every effort … so that the message of the gospel comes also to those who have ceased the practice of their religion.” [CIC 528, 1] If evangelization, what Pope Paul VI called “the essential mission of the Church,” means bringing the good news to those who have not yet fully heard it, then the flip side of that, so to speak, is bringing the good news again to those who may well once have heard it but who, for whatever range of reasons, have not yet accepted it as really good news. Whatever we are or do - as individuals, as a parish, as a Church – the goal must always be to bring us all back together, so that we may eventually all be together, here and now at this altar, and forever in God’s kingdom. Homily for the 23rd Sunday in Ordinary Time, Immaculate Conception Church, Knoxville, TN, September 4, 2011. I have no idea what the President is going to say - one week from today - about how he proposes to solve (or, more likely, how he thinks the Congress should solve) our country's pressing problems. So far, the preponderance of media attention seems to be focused on the rescheduling of the speech to September 8 after the Speaker of the House rejected the White House's first proposed date of September 7. The media is having a field day doing its usual Who's Up?/Who's Down? routine - the media's default position for covering our politics, its substitute for convering actual issues that matter to people's lives and our country's future. Given that there is no known President for a House Speaker publicly rejecting a publicly announced date for a Presidential Throne Speech, it is evident that the Speaker has won this round. While there is ample historic precedent for the President to want to come the very day Congress reconvenes, the White House's apparent attempt to compete with the Republican candidates' debate was too transparently silly to merit any serious sympathy. What are they thinking in the White House anyway? Other than predictable right-wing ideologues, who really care about this debate? Other than professional political pundits, how many people care or even knew it was scheduled? Why elevate that trivial event's significance with such a lame attempt ro compete with it? The fact that this latest mess-up is what we are now talking about again highlights, however, what an unserious country we have become - and the utter unlikelihood of any concerted effort really to resolve our multiple national crises. So now the President can compete with Football for an audience - a perfect metaphor for the distracted nation we have chosen to become. As I said, I have no idea what the President plans to say. If he were to ask my advice, I'd challenge him to channel his inner Harry Truman and "give 'em hell." Unfortunately, it's hard to picture this particular President as Harry Truman. But a Harry Truman is precisely what this country needs right now. In particular, a Harry Truman is what this particular campaign will need - someone who will tell it like it is to the American people and expose the Opposition for what it is.